Are you frustrated with leads you can never contact? With our NEW PAY PER CALL program, you'll always connect with a live prospect every time. Executive Leads will put you on the phone with an online shopper who's been qualified and ready to talk. Our Live Transfers will give you a 100% connect rate and a higher ROI. If your looking for quality live transfer leads give us a call and speak with a marketing specialist today. With over a decade of internet advertising experience and industry know how, let us deliver the quality leads your looking for. Executive Leads Phone Verifies each lead to ensure quality, interest and better contact rates for our clients. We guarantee that our leads will out perform any other internet lead. 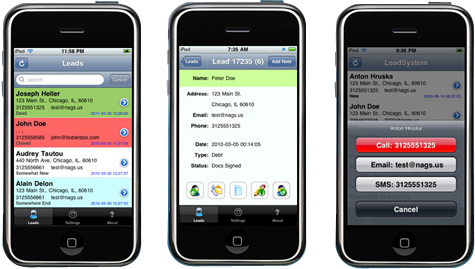 Let us deliver Quality Exclusive and Shared phone verified leads for your business. Executive Leads and our staff have extensive knowledge of the sales cycle and industries we service. With over a decade of call center and internet advertising experience we are confident that we can put together a lead proposal that fits your budget and gives you the ROI your looking for. Companies large and small rely on Executive Leads solid marketing skills for high quality, profitable leads. Whether its Pain Cream Leads or leads in the financial industry, Executive Leads can deliver high converting leads for your business. For more information about Executive Leads, how CPL, CPA or CPS advertising works, or for general questions about lead generation, please contact us. Executive Leads inc. expands sales department. Executive leads Inc rolls out New Debt Lead Program with aggressive sign up for new customers.